Basil Liddell Hart, the son of the Reverend Henry Hart and Clara Liddell, was born on 31st October 1895. Educated at St. Paul's School and Corpus Christi College, Cambridge he left on the outbreak of the First World War to join the British Army. He became an officer in the King's Own Yorkshire Light Infantry. During the war he saw action at Ypres and the Somme. Wounded twice he was company commander by the end of the war. After the war Liddell Hart wrote Infantry Training Manual (1920) before being invalided out of the British Army in 1924. He was military correspondent for the Daily Telegraph (1925-35), The Times (1935-39) and the Daily Mail (1939-45). In his articles and books Liddell Hart became the world's leading exponent of using tanks as an independent striking force to make deep penetrations into enemy territory, cutting off enemy troops from their supplies and high command. Whereas German soldiers such as Erwin Rommel and Heinz Guderian read his books and developed what later became known as Blitzkreig. His ideas were largely ignored in Britain, although he did serve briefly as personal adviser to Leslie Hore-Belisha, the Secretary of State for War (1937-1940). Liddell Hart was one of Britain's leading military historian. Books by him included The Real War, 1914-1918 (1930), Foch, The Man of Orleans (1931), A History of the First World War (1934), The Ghost of Napoleon (1935), When Britain Goes to War. Adaptability and Mobility (1935) and Europe in Arms (1937). After the Second World War interviewed several leading German generals including Guenther Blumentritt, Hasso Manteuffel, Wilhelm von Thoma, Kurt von Tippelskirch and Gotthard Heinrici. This provided material for his book, The Other Side of the Hill (1948). 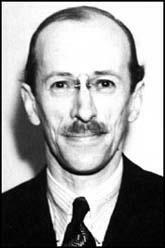 Basil Liddell Hart died in 1970. Even when the machine gun had obviously gained a dominance of the battlefield. General Headquarters in France resisted its growth from the puny pre-war scale of two in each battalion. One army commander, Haig, declared that it was 'a much overrated weapon' and that this scale was 'more than sufficient'. Even Kitchener laid down that four were a maximum and any in excess a luxury - until the Ministry of Munitions came to the rescue of the machine-gun advocates and boldly multiplied the scale of provision by sixteen. It was due also to Mr. Lloyd George that the Stokes gun, a quick-firing light mortar, had the chance to surmount the official barrier and develop into the outstanding and ubiquitous trench weapon of the war. And later, the Ministry of Munitions succored the tank when it was repeatedly threatened by the suffocating embrace of the War Office. When gas was discharged against the French trenches at Ypres, there were no reserves at hand to pour through the wide breach it created. A strange green vapour, a surging mass of agonized fugitives, a four-mile gap without a living defender - such was the sequence of events. But the resistance of the Canadians on the flank of the breach and the prompt arrival of English and Indian reinforcements saved the situation in the absence of German reserves. The chlorine gas originally used was undeniably cruel, but no worse than the frequent effect of shell or bayonet, and when it was succeeded by improved forms of gas both experience and statistics proved it the least inhumane of modern weapons. But it was novel and therefore labelled an atrocity by a world which condones abuses but detests innovations. Thus Germany incurred the moral odium which inevitably accompanies the use of a novel weapon without any compensating advantage. of a great strategic surprise, and owing also to tactical mishandling, and minor technical defects, they had only a limited success. Although the higher military authorities lost faith in them, and some urged then - abandonment, more discerning eyes realized that here was a key which, when properly used, might unlock the trench barrier. The Western Front, the Balkan front, the tank, the blockade and propaganda have all been claimed as the cause of victory. All claims are justified, none is wholly right, although the blockade ranks first and began first. In this warfare between nations victory was a cumulative effect, to which all weapons - military, economic, and psychological - contributed. Victory came, and could only come through the utilization and combination of all the resources existing in a modern nation, and the dividend of success depended on the way in which these manifold activities were coordinated. It is even more futile to ask which country won the war. France did not win the war, but unless she had held the fort while the forces of Britain were preparing and those of America still a dream the release of civilization from this nightmare of militarism would have been impossible. Britain did not win the war, but without her command of the sea, her financial support, and her army, to take over the main burden of the struggle from 1916 onwards, defeat would have been inevitable. gave, victory would have been impossible. And let us not forget how many times Russia had sacrificed herself to save her allies; preparing the way for their ultimate victory as surely as for her own downfall. Finally, whatever be the verdict of history on her policy, unstinted tribute is due to the incomparable endurance and skill with which Germany more than held her own for four years against superior numbers - an epic of military and human achievement. What is really more remarkable than the German generals' submission to Hitler is the extent to which they managed to maintain in the Army a code of decency that was in constant conflict with Nazi ideas. Many of our own soldiers who have been prisoners of war have borne testimony to this. Moreover, in visiting France, Belgium, and Holland since the war I have often been candidly told, by staunch anti-Nazis, that the general behaviour of the occupying German Army - as distinct from the S.S. - was better than that of the Allied Armies which came to liberate them. For that due credit has to be given to the generals, and to Rundstedt in particular. Where the German generals can be justly criticized is for the way they tended to dose their minds to the excesses of the Nazis, and for their lack of moral courage, with some exceptions, in protesting against things they would not have done themselves. Nevertheless, it is obvious from any study of Hitler's brutal orders that the scale of atrocities, and the sufferings of the occupied countries, would have been much worse still if his sweeping intentions had not been tacitly disregarded or at least modified by the military commanders. The escape of the British Army from France has often been called "the miracle of Dunkirk". For the German armoured forces had reached the Channel coast behind the back of the British Army while this was still deep in the interior of Flanders. Cut off from its own bases, and from the bulk of the French Army, it seemed likely also to be cut off from the sea. Those who got away have often wondered how they managed to do so. The answer is that Hitler's intervention saved them when nothing else could have. A sudden order stopped the armoured forces just as they were in sight of Dunkirk, and held them back until the retreating British had reached the port and slipped out of their clutches. But although the British Army thus escaped from the trap in France, it was in no state to defend England. It had left most of its weapons behind, and the stores at home were almost empty. In the following months Britain's small and scantily-armed forces faced the magnificently equipped army that had conquered France with only a strip of water between them. Yet the invasion never came. At the time we believed that the repulse of the Luftwaffe in the "Battle over Britain" had saved her. That is only part of the explanation. The last part of it. The original cause, which goes deeper, is that Hitler did not want to conquer England. He took little interest in the invasion preparations, and for weeks did nothing to spur them on; then, after a brief impulse to invade, he veered round again and suspended the preparations. He was preparing, instead, to invade Russia. The irony of the bombing was, as both Senger and Vietinghoff remarked, that it turned out entirely to the tactical benefit of the Germans. For after that they felt free to occupy the ruins, and the rubble provided mud better defensive cover than the Monastery would have been before its destruction. "As anyone with experience of street-fighting knows, it is only when buildings are demolished that they are converted from mouse-traps into bastions of defence." Batteries posted and concealed in the ruins were able to enfilade and break up the subsequent British attempts to drive through to the town of Cassino.